Windmill Developments proposes to build a 19.2(+) metre 6-storey condominium on property currently owned by the Southminster United Church. Residents have been consistently asking that our neighbourhood’s maximum height limits be protected by lowering the height of the proposed condominium to 15 metres. The proposed 6-storey 19.2(+) metre condo would be taller than the Church and taller than anything currently allowed in our neighbourhood. Please send your comments by September 30, 2017 to Allison Hamlin, Lead Planner: Allison [DOT] Hamilin [AT] ottawa [DOT] ca. Recently while chatting with my neighbours regarding traffic safety and a local parking issue, I realized few people on my street knew the exact distance cars were allowed to park next to their driveway, or to an intersection. Did you ever wonder what the exact parking rules are? The Planning, Infrastructure and Economic Development Department offers the Planning Primer Program to help residents become more aware of, and more involved in, the land-use planning process. The program is a series of free half-day courses. The City wants to know what you think of the Windmill Development proposal to re-zone the church property to allow for a six-storey apartment building and four townhouses to replace the community hall. Due date for comments is July 11, 2017. Your feedback should be addressed to Allison Hamlin, Allison [DOT] Hamlin [AT] Ottawa [DOT] ca 613-580-2424 x25477. Saving Southminster Church and Old Ottawa South Too! How and why should Southminster Church, this important part of Old Ottawa South, continue to thrive in our community and why should Old Ottawa South fight to keep our R3—three storey residential zoning? At first blush, the current proposal to rezone the church property to allow a nominally 6 storey, but practically a 7 storey condominium, to be built behind the church seems like the perfect answer. But is it really so? Yes, the money the church will receive from the developer, Windmill Development, will pay for repairs that are urgently needed. But what will happen five years down the road when more repairs are required? And, has the church really gotten the best value for the property to be severed from the back? Is the only way to keep the church alive to encroach on the current residential zoning of the neighbourhood with a twenty-plus metre structure as opposed to the current R3 allowance of eleven metres? How can we save the church and the neighbourhood too and why should we care about preserving either? The City of Ottawa has posted the preliminary plans for 1040 Bank Street, that is, a proposal to retain the existing church and to replace the assembly hall at the rear with four townhouses and a 14-unit, six-storey apartment building. To achieve the proposed redevelopment, an application for a Zoning By-law Amendment is required. You can read the planning rationale document here. This year's choices offer a huge variety of places to visit, both near and far, with free guided-tours of over 150 historically, culturally, and functionally significant buildings. Plus, there's a shuttle bus available to ease transit between sites. The City of Ottawa Community and Protective Services Committee will examine the Noise By-law at its meeting Thursday, May 18, 2017. There are no proposed changes to the existing process for special event exemptions. The aim is to reduce noise through: the enforcement of bass noise and vibration; a reduction in the construction noise exemption level; improved enforcement of commercial deliveries and waste collection; and a reduction in the permitted duration of car alarms from 20 minutes to 5. 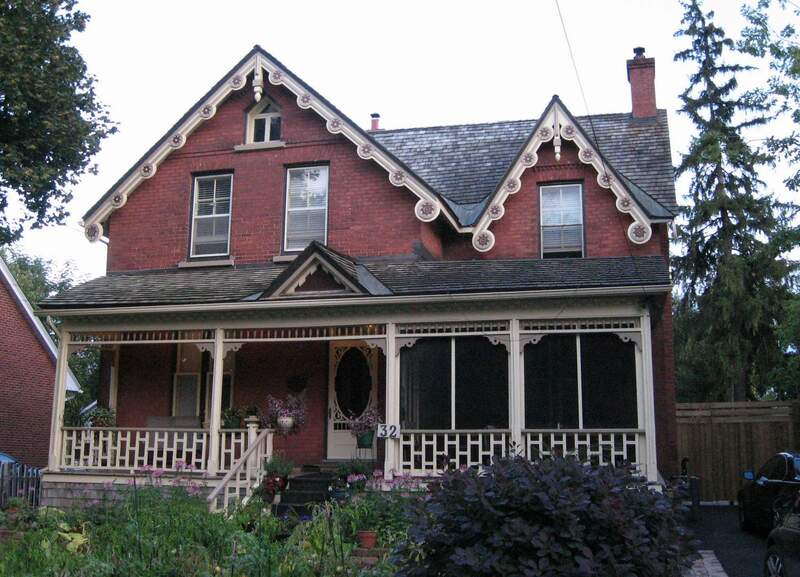 This 1 1/2-storey brick veneer structure was built around 1887 in the then-rural area south of Ottawa. The pitched roof, double-gabled façade, ornate verge boards, and one-storey veranda with its extensive woodwork and central gable are all of architectural interest. The chinoiserie pattern of the railings reveals the handiwork of a proficient local carpenter, but many of the other decorative elements – ranging from the eight-pointed stars in the verge board to the dentils and spindles on the upper part of the veranda – were all manufactured by machine in local planning mills, and could be ordered from design books or catalogues. The L-plan of this house and the asymmetrical façade reflect the ultimate triumph of the romantic sensibility over the Georgian symmetry that had lingered in the Ottawa area.